Designer Gerald Genta started his own brand in 1969, however, this talented haute horlogerie designer also did design work for numereous other watch brands. He is responsibles for some all-time watch classics that were produced in the 1970s. The most spectacular designs are those of the Audemars Piguet Royal Oak, Patek Philippe Nautilus, Vacheron Constantin ‘222‘ (Overseas) and the IWC Ingenieur. However, like I wrote before in the blog post on the Vacheron Constantin 222, these watches become unaffordable. A vintage 222 in stainless steel will cost you around 10.000 Euro, and I only found 1 for sale on chrono24.com. 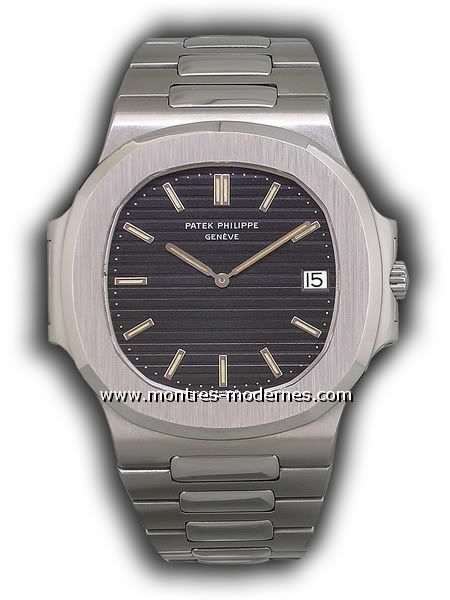 Do you love the vintage Patek Philippe Nautilus ref.3700 and want to save up for one? Asking prices around 28.000 Euro are not unusual. 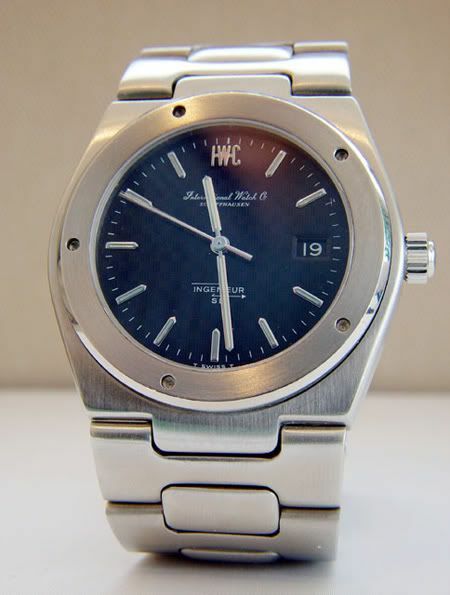 A vintage 1970s IWC Ingenieur SL1832 can be found for around 12.000 Euro. 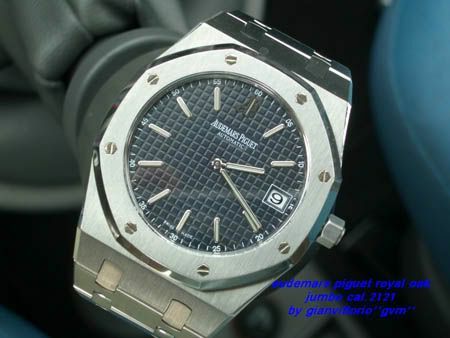 And last not but least, Gerald Genta’s favorite (as he claims in several interviews), the Audemars Piguet Royal Oak 15202ST (A-serie) can be found in so-so condition on chrono24 for just under 10.000 Euro. I don’t directly link to the dealer or seller’s pages, because I am afraid of broken links in the (near) future, but a search on chrono24, the RLX.de sales corner or watchchrono.com will keep you busy for an evening. So, what to do when you admire Gerald Genta’s iconic designs from the 1970s but don’t have that much cash for one of the vintage originals? Taking a look at some of the alternatives? Right answer. All four brands still make these models, but some of them have different movements inside or underwent some optical changes. Let’s compare the original models with the current models that AP, PP, VC and IWC carry in their catalogues. At least price wise the current models are more interesting to get, but do you get what you are looking for? Let’s begin with the watch that started the whole luxury stainless steel sports watch ‘hype’ in the early 1970s, the Audemars Piguet Royal Oak Jumbo. The first model is not very different from the current model (not to be mixed up with the 15300 model, sometimes by ignorance being referred to as ‘Jumbo’). The current model is pictured below, the most prominent changes are in the dial design. Just small things, like the AP logo that went from 6 o’clock to 12 o’clock, the minute index and the white frame around the date window. This one comes very close to its original as pictured above. Even the movement remains to be the same, AP caliber 2121. 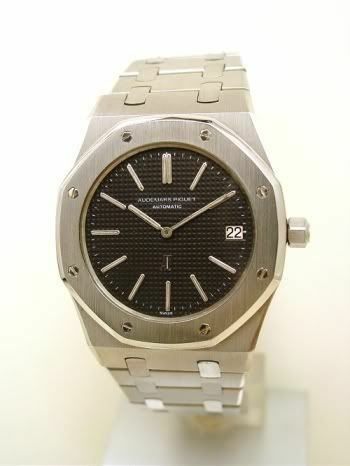 The Audemars Piguet Royal Oak Jumbo (ref.15202ST) has a list price of around 14.000 Euro, however, a slightly used model can be had for approx. 8.000 Euro. So, in my opinion, this makes a great alternative for the vintage model. However, do you want a new(er) watch with some warranty, or pay a 2.000 Euro premium for the original vintage model that probably needs an expensive service first? 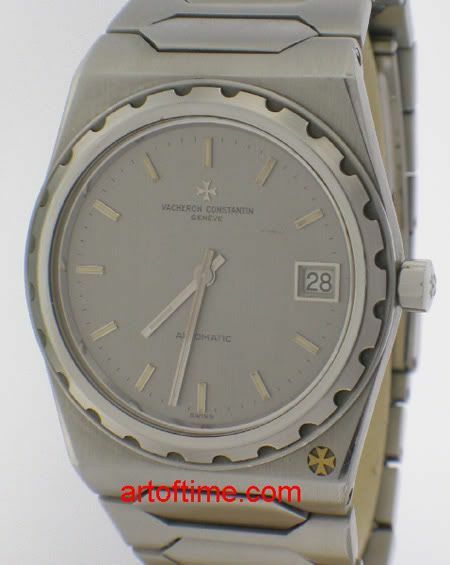 Second is the Vacheron Constantin 222, introduced in 1977. As written before, at the time of this write-up, one is up for sale in Miami for approx. 10K Euro. The original clearly differs from the current Vacheron Constantin ‘alternative’, the Overseas ref. 47040. The Vacheron and the IWC are the two brands that actually make a completely revised version of the original watch, as where Patek Philippe and Audemars Piguet try to stick to the original 1970s model. The differences are too much to write about. See for yourself, even the characteristic Vacheron Constantain logo in the case has disappeared. The design got a total upgrade, from case to buckle, but the influences of the original are clearly there. The going price for the ref.47040 below is approx 6000 Euro. However, one can hardly call this a valid alternative. It is just a nice watch, for a relatively fair price. Up next is one of the most desirable brands, the Patek Philippe. 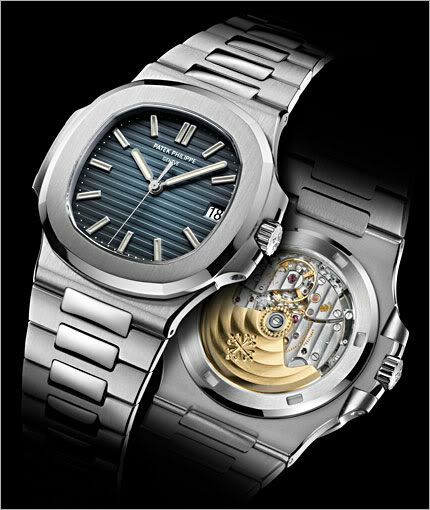 The Nautilus ref.3700 was introduced in 1976, using caliber 28-255. I think this is one of the most desirable stainless steel watches around, together with the vintage Rolex Daytona Paul Newman model (ref.6239). The current version of the Nautilus is the ref.5711/1A, using movement caliber 324 SC. This watch has a going price that is almost equal (if not more) to the list price of approx. 14.000 Euro. That’s about half of the price that is being asked for a nice and complete original 1970s model. The differences are mainly in the movement and in the absence of a second hand in the original as opposed to the new reference. The dial design is quite identical, as is the design of the case and bracelet. And lastly, the IWC Ingenieur. The Ingenieur was originally introduced in the early-mid 1950s and looks completely different from the models pictured below. In 1977, the IWC Ingenieur SL (Steel Line) became available in stores, one year after introduction. The IWC used the inhouse movement caliber 8541ES. During my first years of watch collecting (1998/1999), I really thought this should be the treasure watch. However, there wasn’t much I could find about the correct reference numbers (which one to get) and the prices were quite high at that time already. Being a student, it was impossible to get one for me. IWC introduced a lot of Ingenieur models, including the impressive model released in 1989, that was able to resist magnetic fields up to 500,000 A/m.?Ç¬? The production of the Ingenieur series stopped in 2002. 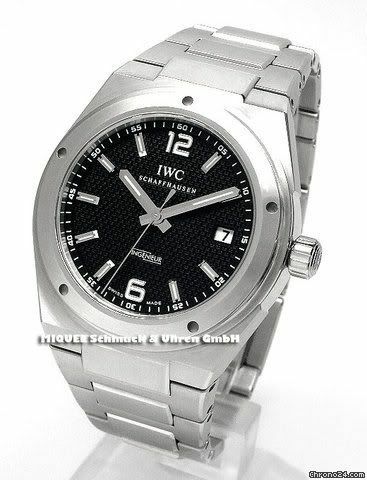 In 2005, IWC re-introduced the Ingenieur with reference number 3227-01. The introduction price was eventually higher than the current list price of 5900 Euro. Due to the impopularity of the watch, it can be had for much less. Approx. 4500 Euro will give you a brand new 3227-01, and slightly used will decrease the price by a few hundreds extra. As you can see below, the ‘core’ of the design is still there. Clearly a design with strong influences from Gerald Genta. In my opinion, stronger than the Gerald Genta DNA in the current Vacheron Constantin Overseas ref. 47040. The new Ingenieur uses IWC inhouse movement caliber 80110. Mind you, that the production of this Ingenieur has stopped already. You can still find them for sale at authorized dealers, but IWC discontinued them and introduced its successor (the Mission Earth model) during the SIHH 2009. Click here for that update. 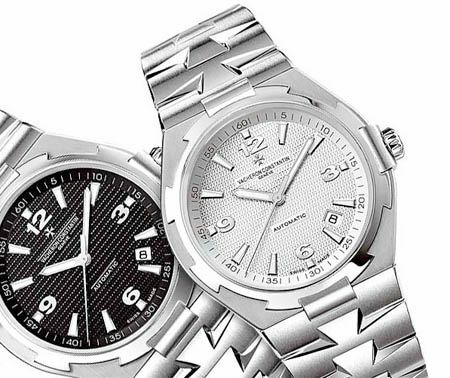 The Vacheron Constantin Overseas and ‘new’ IWC Ingenieur 3227-01 are the most revised models. And in my view, the Ingenieur gets a bit more credits for keeping the Genta spirit. Vacheron could have done more with the Overseas, like keeping the signature in the case or keeping the watch design a bit more ‘squarish’. In this category, also price wise, I would go for the Ingenieur (in fact, I did and wrote a small review on this watch, click here to read it). Although I like the original 1970s models, I would be cautious to spend so much money for a watch that is over 30 years old. Be sure to get one with box, papers and service history. You don’t want to be confronted with damaged or broken parts. All 4 manufacturers will charge you big time on having them overhauled or repaired. I am very curious about what you would do as a watch collector or (at least) aficionado, saving up for the real deal, or go for one of the alternatives. And if so, for which one? Please use the comments functionality below to share your thoughts.